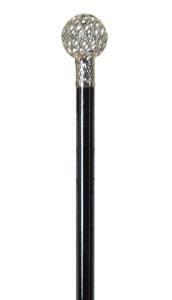 An elegant formal cane suitable for light use as a dress accessory. The chrome-plated handle features a decorated spherical cage atop a smart chrome-plated collar. The shaft is hardwood lacquered a deep, shiny black, and is fitted with a discreet non-slip ferrule. The overall height of the cane is 92cm. Ferrule size: 16mm.